Want a generic domain? Read this important note! The Nigerian registry will soon be publishi.ng a list of reserved, banned or premium domain names. Probably at the end of April 2013. Therefore, if you are planni.ng to apply for a generic or premium style domain, such as for instance cars.ng or bloggi.ng, then please be advised that we may not be able to fulfill the order, as those type of domains are likely to appear on the list. But do go ahead and place the order. As part of the process we will merely verify your credit card. We will not charge the card, until we know that the order can be successfully completed. The .NG TLD is an unrestricted domain. Registrants does not need to have a local company, address or contacts in Nigeria. It is not required to have a Nigerian company or local address in order to register .NG domain names. A local contact is not required. Web Solutions will provide all required contacts for .NG domain registrations. There is no requirement for a Nigerian trademark or international trademark, in order to register Nigerian .NG domains. It is not possible to register .NG IDN domain names with non-ASCII characters. Are generic domains allowed for .NG? In principle, all names are allowed under .NG. However, the registry has classified a selection of domain names as premium. These are mainly 2-letter domains and some high value generic terms. The domains will be made available via an .NG domain auction some time in the future. How much time does it take to register .NG domain name? Usually, it takes 14 day/s to register a .NG domain name in Nigeria. We will file the application as soon as possible. However, we cannot provide guarantees as we have no influence on the speed of the Nigerian domain authority once the application has been filed. What is the minimum of characters allowed for .NG domains? It is not possible to apply for .NG domain names with less than 3 characters. What is the maximum of characters allowed for .NG domains? 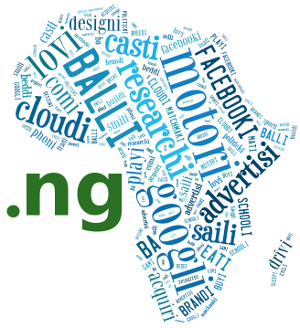 It is not possible to apply for .NG domain names with more than 63 characters. You may register an unlimited amount of .NG domain names. Domain name .NG in Nigeria. Available for registration. Accepted payment methods for .NG domain names include Visa, Master Card, JCB, DanKort, PayPal, Visa Electron, Maestro, UnionPay, American Express, and wire transfer.